A Mark of no Good Neighborhood. The great statesman and patriot, the late lamented HENRY CLAY, once said, in a speech which he delivered in the Senate of the United States—an extract of which is given in another place in this paper—that "it is a mark of no good neighborhood, of no kindness, of no courtesy, that a man living in a Slave State cannot, with any sort of safety, travel in free States with his servants, although he has no purpose whatever of stopping there longer than a short time." If this were the only injustice to which the Slave States are subjected, it could easily be borne. Owners of slaves are not compelled to take this description of property to the free States, and when they do so of their own will, they must expect to put up with the consequences of taking it where the marks of "good neighborhood” in this respect at least, do not exist. But the original wrong, which has been the theme of so much heated discussion in the halls of legislation, and the occasion of so much fierce excitement among the people, still exists to a very great extent, although the Fugitive Slave law is in full force. Slaves continue to abscond, singly and by dozens, from all the border Slave States, whilst but few of them are apprehended and returned to their owners. It is true, the law of Congress is no longer openly resisted, except in rare instances, and the Abolitionists do not present the bold and impudent front they did before its enactment, but they do their nefarious work just as effectually in secret, by means of their "underground railroads," as they are familiarly termed, which are believed to extend from the borders of the Slave States to the Canada line. The slaves are put through with the utmost expedition by secret combinations formed for this purpose, and the swindled owner is then derisively told that they will be surrendered to him, in good faith to the laws of the land, if he can find them. 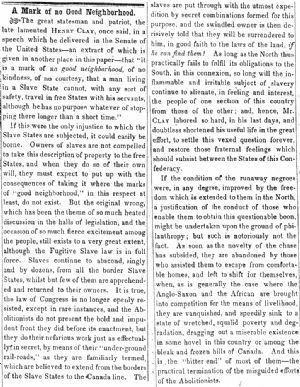 As long as the North thus practically fails to fulfill its obligations to the South, in this connexion, so long will the inflammable and irritable subject of slavery continue to alienate, in feeling and interest, the people of one section of this country from those of the other; and, hence, Mr CLAY labored so hard, in his last days, and doubtless shortened his useful life in the great effort, to settle this vexed question forever, and restore those fraternal feelings which should subsist between the States of this Confederacy. If the condition of the runaway negroes were, in any degree, improved by the freedom which is extended to them in the North, a justification of the conduct of those who enable them to obtain this questionable boon, might be undertaken upon the ground of philanthropy; but such is notoriously not the fact. As soon as the novelty of the chase has subsided, they are abandoned by those who assisted them to escape from comfortable homes, and left to shift for themselves, when, as is generally the case where the Anglo-Saxon and the African are brought into competition for the means of livelihood they are vanquished, and speedily sink to a state of wretched,, squalid poverty and degradation, dragging out a miserable existence in some hovel in this country or among the bleak and frozen hills of Canada. And this is, the "bitter end" of most of them—the practical termination of the misguided efforts of the Abolitionists.